Bruce B. Gordon (company: Bruce Gordon Media) is a director, producer, writer, music producer and songwriter from Los Angeles, California, USA. He is attending the 2014 Cannes Marché du Film for conferences and networking. Gordon will be in meetings to secure financing and distribution for his multiple feature film projects, which are in various stages of development. Bruce Gordon Media is specifically interviewing Executive Producers with a proven track record of working with A-List directors, as well as talent such as Jennifer Lawrence, Robert Di Nero, Al Pacino, Dustin Hoffman, Michael Douglas and Jack Nicholson for a raucous comedy about senior citizen buddies, financially screwed by the system, who enlist a young female music blogger to help them pull a caper against the mob and screw the system back. The screenplay for #OldDawgz is written by Jonathan and Tom Fahn. Gordon will collaborate as a producer. Executive Producers are also being sought for Psyched Up! – a family comedy about a “by-the-books” school psychologist, forced to provide fake mental health excuses for the underachieving, slacker kid of a Malibu gangster. Further, the company is very keen to find Executive Producers with a successful track record of working with first-time feature directors, as Gordon has expanded his short film, Whole ‘Nother Level into a millennium-cast, spy thriller script. 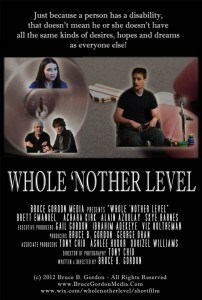 His feature, Whole NEW Level, is about a shy young man with cerebral palsy who’s forced to operate as a covert agent to stop a worldwide murderous conspiracy. Gordon will direct his feature screenplay and collaborate as a producer. The short was selected for the 2013 Festival de Cannes Short Film Corner, and it has garnered further international festival selections and awards. In fact, Whole ‘Nother Level will be screening and in competition in Cannes at the 2014 Festival Entr’2 Marches, a disability-themed shorts festival which takes place across town from and concurrently with the 2014 Festival de Cannes. When: Tuesday, May 20, 2014 in the 6 pm – 9 pm block. Gordon has signed three distribution deals with international VOD firms, including IndieFlix for this film. He has an enduring passion for telling stories of healing and recovery that entertain international audiences, win critical awards, and have blockbuster success at the worldwide box office. Gordon designs his films to bring people together, by focusing on our commonality as humans, as opposed to our individual differences. Accompanying him at the 2014 Cannes Marché is Dr. Gail Gordon, one of the Executive Producers of his short film, “Whole ‘Nother Level.” Besides being a film producer and writer, she is an educational psychologist from Los Angeles who is developing her own features, documentaries, multimedia games and entertainment apps. The couple will be dividing their time between bases at the Cannes Marché, the American Pavilion and the International Scriptwriters’ Pavilion of the Maison Des Scénaristes. They will be in Cannes from May 14 – May 25, 2014 and can be reached at: BruceGordon.Media@gmail.com via e-mail.